An opportunity exists at Student One, 363 Adelaide St, Brisbane for a Healthy Habits store. Share in our passion of bringing healthier, feel good food to life. Training focuses on making you "business ready" ensuring that by the end of the program you have an understanding of Healthy Habits and the retail hospitality industry. Part of the course is theoretical, usually at our Melbourne Training Centre, the balance is practical in store retail training. No previous experience in the health or food industry is required! - Is passionate about feeling good and modelling a Healthy Habits way of life! 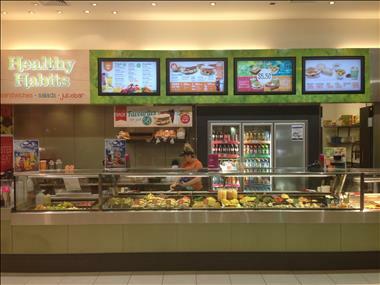 Healthy Habits has grown to over 28 stores on the eastern seaboard of Australia with a furter store in New Zealand. Our growth and passion has seen us recognised throughout the fast food industry as a leader in providing great tasting, healthy food. We provide customers with a health, guilt-free choice and proudly have almost 40,000 people each week choosing our delicious sandwiches, salads and juices. In 2016, the Cold Rock system was purchased by Franchised Food Company (FFCo). Today, the Healthy Habits brand has grown primarily on the eastern seaboard of Australia and one store in New Zealand. Mainly positioned in metropolitan and suburban shopping centres, we are committed to further growing our network, delivering fresh and friendly service and great tasting food.